This selection of holiday songs by the CGT is sure to enchant and delight. Acoustically, Paul, Bert, and Hideyo truly shine with all the precision and innovation you've grown to expect from the California Guitar Trio. “Every year, the Christmas season brings a load of new releases on the DJ's shelves. But every time I wonder who will reinvent Silent Night or Jingle Bells. Who will surprise me? 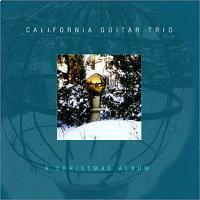 In 2002 it was this trio from California who, in my opinion, surpass everything else. They brought out a Chrismas CD with a simple concept but with just the right originality to avoid the trap of banality. Unlike so many Christmas releases this is not an ambient sounding recording; you can turn up the volume on this one. Almost all the great classics are there. I have to tell you by the way that the CGT tours the planet. If their journey passes by you, make sure to go see them.” - LCBO Magazine (Liquor Commission Board of Ontario).